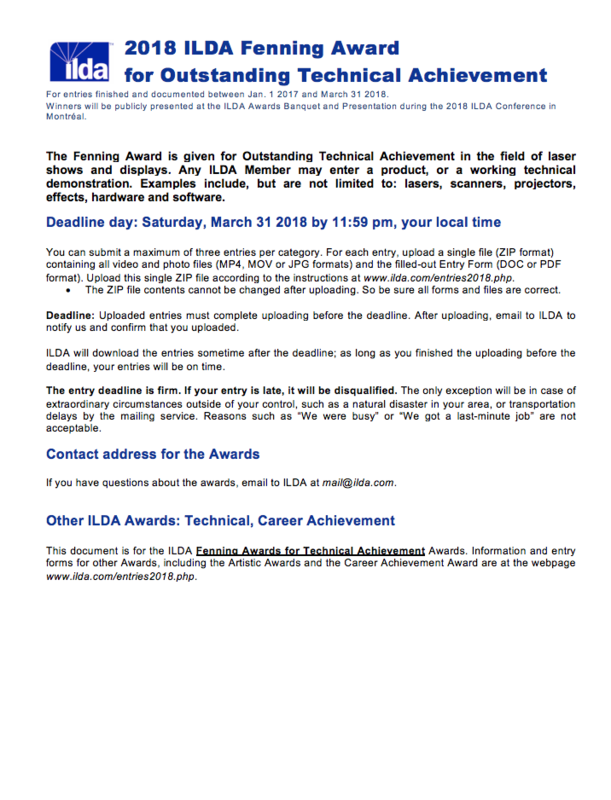 The deadline for entering the 2018 ILDA Awards has passed. Thanks to everyone who entered. If you entered on or before Saturday, March 31 but you are NOT on the list below, contact ILDA as soon as possible. A few entrants have not yet renewed their 2018 ILDA dues. If you are not sure of renewing, log into ildamember.com and check that you are a 2018 Member. Non-member entries will not be judged. This page is for persons entering the 2018 ILDA Awards. You may enter laser shows produced or performed between January 1, 2017 and March 31, 2018. Winners of these Awards will be publicly presented at the ILDA Awards Banquet and Presentation during the 2018 ILDA Conference in Montréal. The deadline for entering all three Awards is Saturday March 31, 2018, by 11:59 pm your local time. Details are below. •	The Planetarium Show category has been removed. A show presented in a planetarium can still be entered; choose the category that best fits the type of show. Also, planetariums with new or substantially changed laser installations during the eligibility period (Jan. 1 2017 – March 31 2018) are eligible for the new Permanent Installation category. •	The name of the Beams and Screen Show category has been changed to Multi-Effect Laser Show. •	The Abstract category definition has been changed to clearly state that entries can include lumia and other non-representational laser imagery. •	The Laser Fine Art category has been combined with the Innovative Applications category. The new combined category is named “Innovative and Fine Art Laser Applications.” The description for this category is the same as the previous description for Innovative Applications. •	A new category has been added, Permanent Installation. This takes into account how the permanent installation operates, as well as the artistic quality of the lasers in the space. •	There are no logos or other overlays on ANY Artistic Award entries including entries showing trade show booths. These are distracting and potentially could influence judging. •	No different audio can be added or overlaid to an entry. This means the audio must be the same as when the laser visuals were originally presented. It is permitted to replace poor quality audio with better quality audio, but the same music parts must be used. •	If a Statement of Intent has any identifying information about the entrant (company name, employee name, product name, etc. ), ILDA has the option to delete the entire Statement of Intent. Also, if the Statement of Intent is significantly over the 600 character limit, ILDA has the option to delete the entire Statement of Intent. •	Videos cannot show laser beam exposure on or near the heads of performers. See the section on “Entry Safety and Legality” for more information. •	The Awards Committee voted to keep using the judges scoring spreadsheet. This lists four aspects on which each entry is given a 0-5 score: Technical competency, Artistic competency, Quality and variety of laser effects, and Visuals following music. After judging is complete, each entrant receives their scores, and is able to see how they did relative to the other entries. •	An entry submitted in one category can be moved to another category, if the judging coordinator or other Awards Committee-designated reviewer(s) feel the other category better fits and describes the entry. •	Judges will no longer be permitted to move entries. They must be judged in the category that was submitted to them, by the judging coordinator or other Awards Committee-designated reviewer(s). Note that the Fenning Technical Awards do NOT use an Entry Spreadsheet. Persons who are not ILDA Members can enter in the IDN Standards category. You do not need a special entry form to nominate someone for ILDA’s highest honor, the Career Achievement Award. You can simply enter by sending one or more nominations by email to ILDA by the deadline, Saturday, March 31, 2018 (at 11:59 pm your local time). To enter, submit the nominee's name, plus a biography/description of the person. This should go beyond just a "resume listing" of places they have worked. It should include information about the career of the nominee and why his or her achievements are significant. If you are nominating another person, feel free to work with them, so they can help put together this document. To re-nominate someone, email to ILDA by midnight, your local time, Saturday, March 31, 2018. All nominations received by the deadline, plus the "automatic" nominees, will be listed on the ILDA website later in the year. ILDA Members will be able to vote via email for the CAA nominees. And, at the 2018 ILDA Conference in Montréal, the winner of the 2018 Career Achievement Award will be publicly announced. 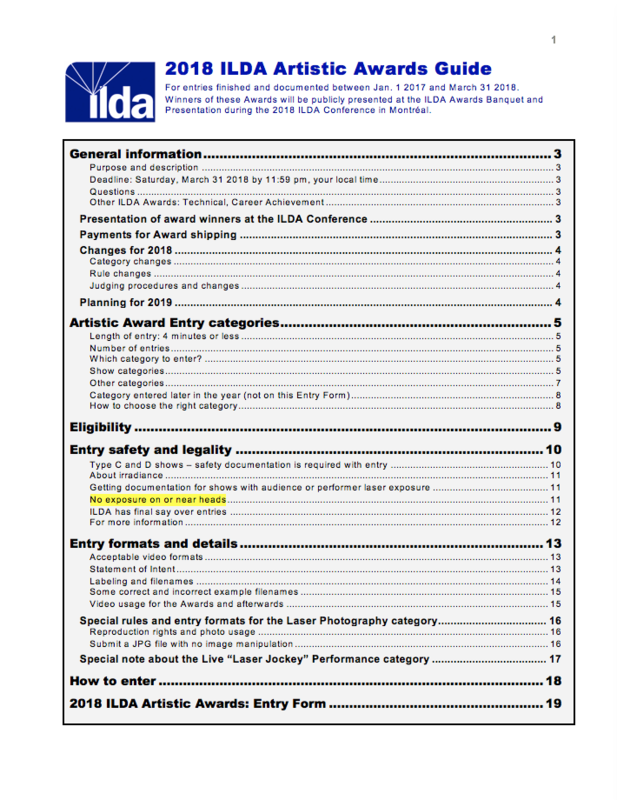 When you are completely finished and ready with your forms and videos, submit your 2018 ILDA Artistic and Technical entries by uploading them to your own filesharing service such as Dropbox, Google Drive or OneDrive. Then email to ILDA with the link where we can download your file.